By the time British actor Ed Skrein was cast in the upcoming “Hellboy” reboot, the word “whitewashing” already felt like it had been in entertainment headlines every other week. And perhaps it’s because, even in 2017, whitewashing is still a common practice in Hollywood when it comes to Asian characters and stories. From “Ghost In the Shell” to the upcoming “Annihilation” film, this year — like every year, it seems — wasn’t without its casting controversies. But where actors and directors have fumbled questions all year about whitewashing, something different happened in August: Within a week of Skrein’s casting announcement, the widespread criticism prompted him to step down from the film. In September, the studio announced the role would go to Daniel Dae Kim, who had made headlines over the summer when he and “Hawaii Five-0” co-star Grace Park left the show over salary disputes. “Inclusion and diversity are all very popular buzzwords, and extremely important, but what I challenge everyone in this room to do is move beyond these notions of simply being included, but to lead,” Kim said at this year’s Unforgettable Gala, where and he Park received BMW’s Ultimate Drive award. If 2016 was a year of cringe-worthy casting news, then 2017 was a year for Hollywood to answer for its decisions — not because Asian Americans were asking (as they’ve been asking for years), but because it was an outcry they couldn’t ignore any longer. But what those responses missed were the acknowledgement that Hollywood still has a diversity problem that audiences have been pointing out long before the age of hashtags and blog think pieces. When asked about the “Ghost In the Shell” controversy for Marie Clare, Johansson said she would never play a character of another race and pivoted the conversation to one about gender equality. In February, Damon told NBC News his leading role in “The Great Wall” was misunderstood and that people wouldn’t be upset after they actually watched the film. While Damon was right in that his character wasn’t exactly “whitewashed,” “The Great Wall” had more problems to deal with than Damon’s face prominently displayed on the film posters: critics called the plot boring, the dialogue awkward, and the performances dull. At the box office, the film earned about $18 million during its opening weekend in the U.S. — just a small fraction of the estimated $150 million the Zhang Yimou-directed epic cost to make. According to The Wrap, “The Great Wall” also did not meet expectations in China, bringing in just $170.4 million during the first three months it was in theaters. “Ghost In the Shell” didn’t fare any better. After a tough opening weekend at the box office, Deadline reported in April that the film would lose more than $60 million overall, and experts attributed the flop to the film’s extraordinarily high production costs and the fact that the studio did not know how to handle the whitewashing controversy. Has 2017 been a lesson for Hollywood? In November, film scholar Rob Buscher talked to NBC News about how many Asian-American stars of early Hollywood — even those who were born in the United States — were typecast into “exotic” roles, while white actors were cast as Asian heroes. One of those who struggled the most with this was Chinese-American actress Anna May Wong, who rose to fame in the 1920s. “She was born in Los Angeles in Chinatown, so she was fully Americanized, yet the kinds of roles she got were highly troped Asian roles that reinforced stereotypes,” Buscher said. Wong eventually moved to Europe for a good portion of her career in pursuit of stronger roles — something that isn’t uncommon with Asian-American actors and actresses today (like “Designated Survivor” star Maggie Q “Into the Badlands” star Daniel Wu) who have found fame abroad before returning to the U.S. to bigger opportunities. 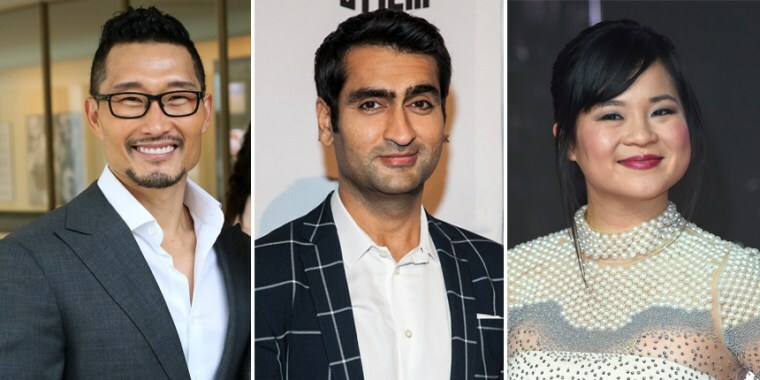 But with Asian-American creators and talent producing some of this year’s buzziest projects, the idea that “there aren’t any Asian movie stars” no longer holds up. Actor and director Justin Chon’s film about the L.A. riots, “Gook,” walked away from Sundance in January with the Next Audience Award and was acquired by Samuel Goldwyn Films in April. Told from the perspective of two Korean-American brothers, “Gook” was drawn from Chon’s own family’s experience during the riots and was completed with Kickstarter funds. The goal was $30,000, which Chon told NBC News in 2016 was the bare minimum that would help him finish the film. It ultimately raised $56,272. Note to self: I will not rest till my asian american stories are told. I will not stop until they are real. No one can dissuade me. Nothing will stop me. And after a fierce bidding war at the start of the year, Amazon acquired the distribution rights for Kumail Nanjiani’s romantic comedy “The Big Sick” for $12 million. The film, which stars Nanjiani and was written by Nanjiani and his wife Emily V. Gordon, tells the real-life story of Nanjiani and Gordon’s relationship. With a budget of $5 million, “The Big Sick” grossed over $42 million in the U.S., making it one the year’s highest-grossing independent films. While writing “The Big Sick,” Nanjiani said he and Gordon were aware that the families portrayed may not be the kinds familiar to most fans of romantic comedies. “We wanted to have a rom com that was very sweet and about all kinds of parents,” Nanjiani told NBC News shortly before the film’s release. The comedian and “Silicon Valley” star also spoke about how comedians of color are often pigeonholed into writing about their ethnicities in their work. One of the most controversial lines in “The Big Sick” occurred when the fictional Kumail makes an ill-timed joke about 9/11 to his girlfriend’s parents. “I wanted to put that in because when I was a comedian starting out, people wanted me to do ‘ethnic comedy’ material and I wouldn’t want to do it. And this is me being like, ‘You want an ethnic joke, well here’s the worst one possible,’” Nanjiani explained. While “The Big Sick” continues to thrive in the spotlight (it recently was nominated for two Screen Actors Guild awards), 2017’s successes were not enough to check every box when it comes to on-screen representation. “The Big Sick,” along with hits such as “Master of None” and comedian Hasan Minhaj’s Netflix special “Homecoming King,” has been the subject of some criticism this year that points out the absence of South Asian American women in its storytelling. “A lot of these people are telling personal stories with ‘Master of None’ and things like ‘The Big Sick,’ and you don’t want to say, ‘This is the only type of story you can tell,'” said Swapna Krishna, co-host of the “Desi Geek Girls” podcast. A lot of these people are telling personal stories with "Master of None" and things like "The Big Sick," and you don’t want to say, "This is the only type of story you can tell." One example from 2017 that contributed to the diversity of representation: film festival favorite “The Tiger Hunter,” directed by Lena Khan. The film stars Danny Pudi (“Community,” “DuckTales”) as Sami Malik and features Indian-Canadian actress Karen David as Ruby, Sami’s love interest. Khan, who is Indian American, told NBC News in September ahead of the film’s theatrical release that it took her years to realize that “mainstream” audiences would be interested in her stories, particularly from her perspective as a young Muslim woman who wears a hijab. With the year coming to an end, 2017 looks to be ending on a higher note than where it began: Disney announced it had chosen a Chinese actress to star in its 2019 live-action “Mulan” adaptation, Vietnamese-American actress Hong Chau received a string of Best Supporting Actress nominations (Critics’ Choice Awards, Golden Globes, and Screen Actors Guild Awards) for her role in the Matt Damon-led comedy “Downsizing,” and one of the year’s most-anticipated films introduced the world to Kelly Marie Tran, whose portrayal of Rose Tico in “Star Wars: The Last Jedi” has added to the diversity seen throughout the franchise in recent years. As Hollywood struggles to come back from a rough year, 2018 could see diversity continuing to triumph at the box office. The Ava Duvernay-directed blockbuster “A Wrinkle in Time” and the “Ocean’s” trilogy spin-off “Ocean’s 8” are just two of the major films bringing Asian-American talent to the screen: Mindy Kaling will feature in both films and Awkwafina will appear in “Ocean’s 8” — the second of two big summer movies for the rapper turned actress. In August 2018, Awkwafina will be seen in “Crazy Rich Asians,” the Jon M. Chu-directed screen adaptation of Kevin Kwan’s best-selling novel. Starring “Fresh Off the Boat” actress Constance Wu and newcomer Henry Golding, “Crazy Rich Asians” will be the first film since “The Joy Luck Club” in 1993 to feature an all-Asian principal cast. A future, Tseng added, that will be more telling of whether or not Hollywood is finally paying attention.